The fight between Microsoft and Google battling for supremacy is nothing new. Both tech giants struggle for relevance in a world where Facebook gains momentum every day. In the cloud, however, the two behemoths compete with just themselves in the lunch line, each hoping to get the choice business from the lucrative cloud-hungry government and business markets. Microsoft hopes to downplay how the core of its office suite resides locally, not in the cloud with its Office 365 Web-based tools. Hoping to sell a mix of Web-based and cloud-based applications, Microsoft wants its customers to enjoy a blend of old and new technologies as it scrambles to bring the rest of its suite into the cloud. From the get-go, Google seems poised to make major gains in the enterprise, mainly because all of its office applications already reside in the cloud. Companies unwilling to accept Microsoft’s plan to mix cloud and local apps find a capable competitor in Google. Its cloud-based product is mature and already proven in the enterprise. Google buttresses its position as the solution for the present in its native mobile apps that allow people to work from anywhere. Google’s already huge lead versus Microsoft in the cloud has extra momentum because of its price. Google lists its service at €4 a month for each user or an annual payment of €40 per user. This compares with €5.25 per user for Office 365 for Professionals and Small Business. This package includes the Office Web Apps tools, but it only serves 25 or fewer users. The basic package includes features equivalent to the old Business Productivity Online Standard Suite (BPOS) costs €9 per user per month, but it does not come with the Web-based apps. 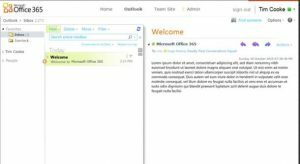 The top-tier Office 365 enterprise package costs a list price of €22.75 per user. 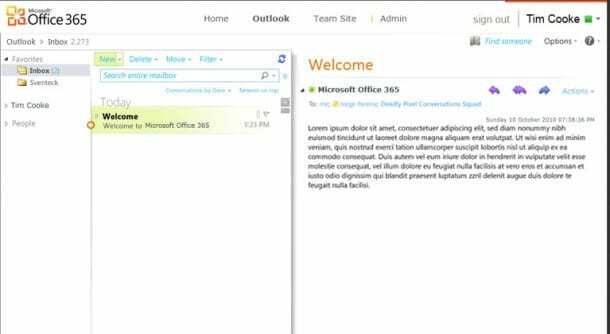 This adds the Office Web Apps package to the standard Office 365 features. Google has a significant price advantage, especially for customers who want more Web-based applications. Remember, even when buying the Enterprise package, the productivity applications such as Word and Excel still run on the local desktop. Google boasts a speed advantage over Microsoft in areas where the latter has the wherewithal to compete. 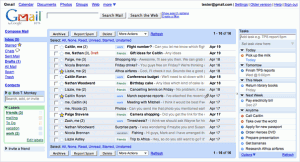 From mail to collaboration, Google has optimized its Apps suite for the Web. Its speed trounces Microsoft’s offerings, even when companies serve them from the premises. We already noted that Google beats Microsoft by providing native mobile apps that keep people productive wherever they have their smartphone or tablet. However, the accessibility of Google Apps goes beyond that to include its uptime guarantee. Although Microsoft and Google both pledge to have nearly 100% uptime, Microsoft exempts itself from maintenance downtime; Google includes it. Coupled with its public status board, Google seems to have the clear upper-hand when it comes to offering an accessible and reliable cloud-based office platform. Google clearly has emerged as the strongest player in the battle for the enter price cloud. It doesn’t match Microsoft feature-by-feature (for example, Google doesn’t offer multi-party videoconferencing and meetings), but it does offer a product ready to meet their customers in the cloud where IT has headed for years. Microsoft probably will manage to limp along until it gets its entire suite in the cloud. Until it does, Google will continue to beat up Microsoft and probably take its lunch money too. Want help setting up Google apps let us know.